How many home games could Highlands, NC have in the football playoffs? Allen Ramsey Photo. Highlands senior defensive lineman DJ Mills (42) tries to tackle Holmes' Andrew Arnold (10) in a recent game. The Bluebirds could be at home four times in the playoffs. The Highlands Bluebirds football team could have four home playoff games this postseason like two years ago. How can Highlands control Warren Central, Feggins on Friday? Allen Ramsey Photo. Highlands cornerback Austin Beal intercepts a pass against Holmes in a recent game. Beal could be matched up against old teammate Jensen Feggins on Friday at Warren Central. One can either give in to the adversity or rally around teammates and conquer it. The Highlands Bluebirds football team (7-2 overall) is known for doing the latter and it hopes to do that this week on a long road trip to end the season. Highlands fell to Cincinnati Elder, 49-35 on Friday in Fort Thomas and wants to remove that sour taste from its mouth and head into the postseason on a high note. What does NC need to do to beat streaking Beechwood? Allen Ramsey Photo. Newport Central Catholic senior Clint Bartels (4) looks for running room in a recent game against Newport. 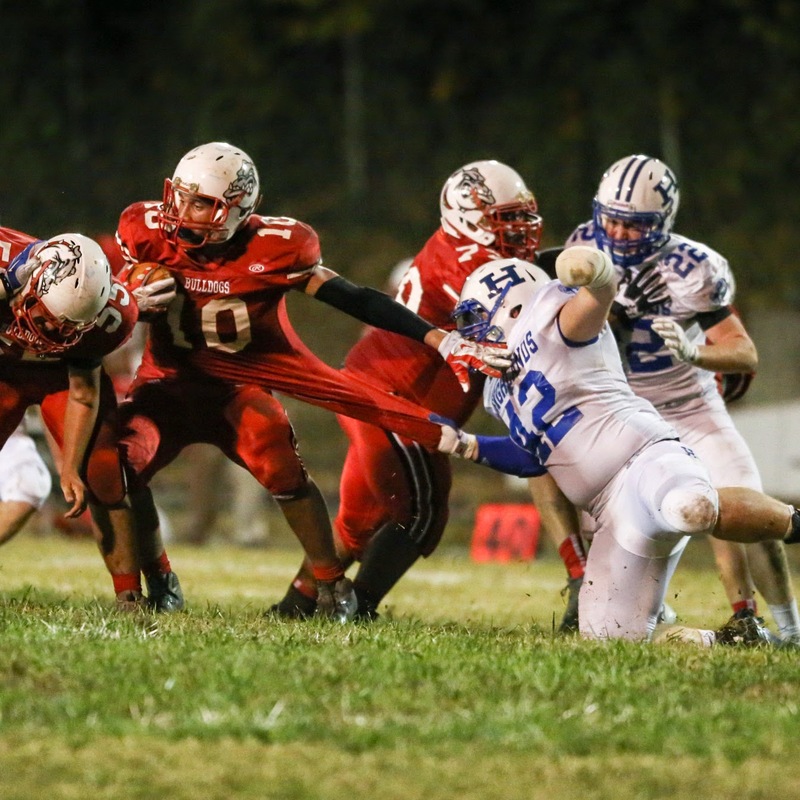 The Thoroughbreds are aiming for their fifth straight win of the season Friday against Beechwood. This line should be familiar entering the season finale for both teams. The Newport Central Catholic Thoroughbreds and Beechwood Tigers football teams once again rolled through their respective districts and want to continue that momentum entering the playoffs. NewCath (4-4) of Class 6-2A has won four straight and Beechwood (7-2) of District 4-1A has won seven in a row. 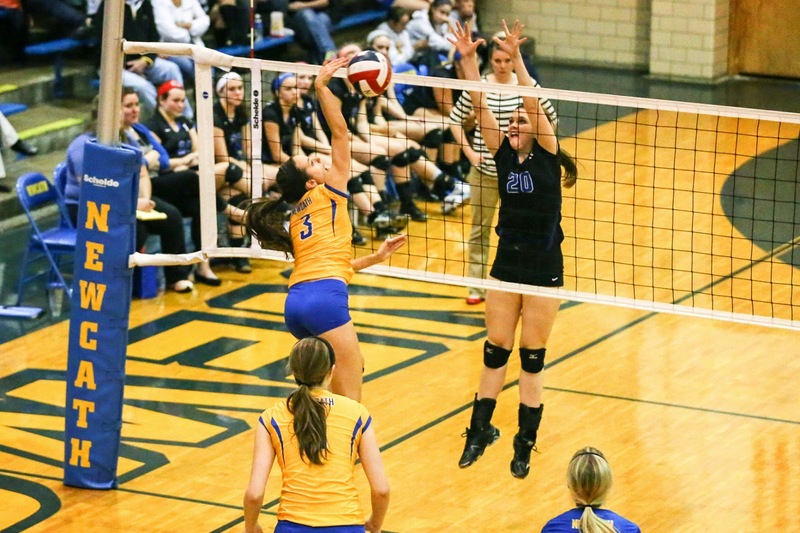 The Newport Central Catholic Thoroughbreds volleyball team saw its season end Wednesday in the 9th Region quarterfinals to the Cooper Lady Jaguars, 3-1 (25-17, 25-13, 16-25, 25-15). How much did Highlands volleyball improve this year? The season once again came to an end in the 9th Region quarterfinals. But it saw marked improvement for the Highlands Ladybirds volleyball team. Highlands improved four wins from each of the previous two seasons finishing 17-18 overall. Perennial 9th Region volleyball Notre Dame handled the Ladybirds, 3-0 (25-11, 25-4, 25-9) at Ryle on Tuesday. Did NC end Notre Dame's region win streak? G. Michael Graham Photo. Newport Central Catholic's Loren Zimmerman (center) plays the ball while Taylor Tolle (right) moved upfield in the 9th Region title game against Notre Dame. Notre Dame won its 11th straight region game with the 3-0 win. 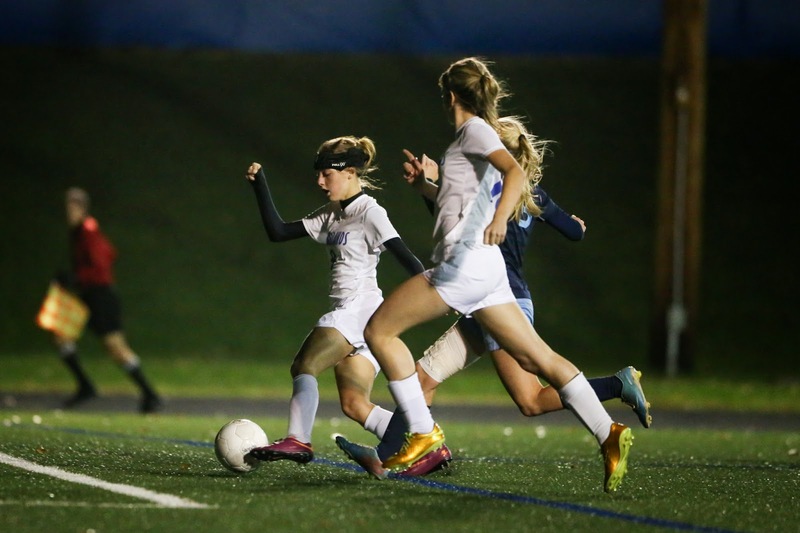 UNION – Until someone develops the depth they possess, the Notre Dame Pandas may continue to rule the 9th Region in girls soccer and contend for state championships. 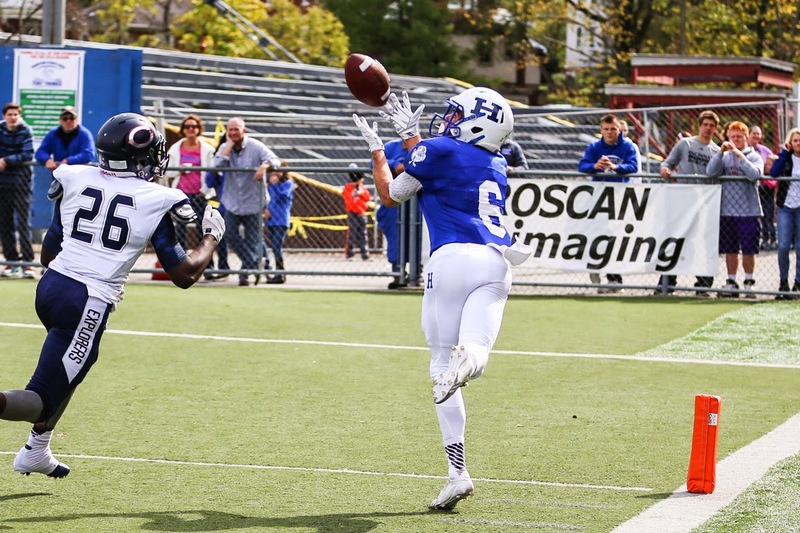 Did Highlands manage its first win over Elder at home? Allen Ramsey Photo. Highlands quarterback Beau Hoge takes the snap while Josh Watson (28) and Chandler New (14) head downfield in Friday's game against Cincinnati Elder. Things have not been kind to the Highlands Bluebirds this year against non-Kentucky competition. 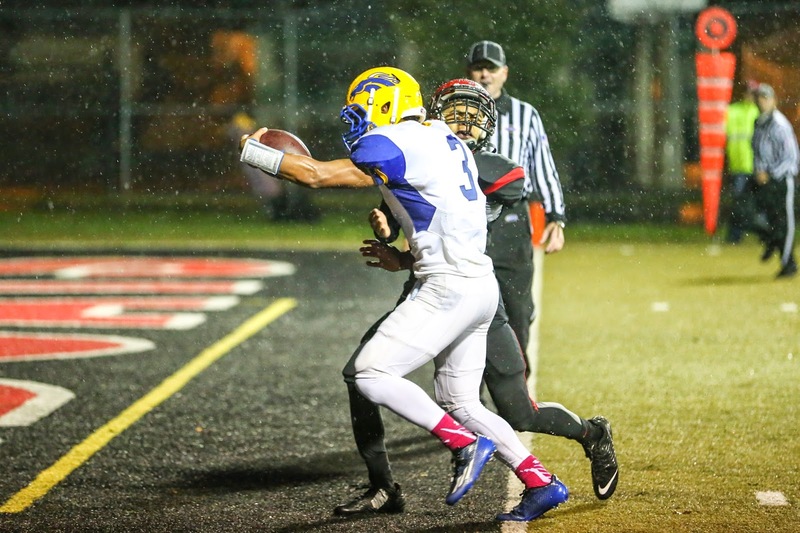 Who might the Bluebirds face in the first round of 4A playoffs? Allen Ramsey Photos. In the top photo, the Highlands student section dressed in orange to show support for freshman Brady Walz, who is battling Leukemia. The bottom photo shows Highlands junior wide receiver Mitch Cain (16) trying for extra yards in Friday's game against Cincinnati Elder. Elder won 49-35. The Highlands Bluebirds football team just can’t seem to find ways to beat the Cincinnati Elder Panthers consistently. 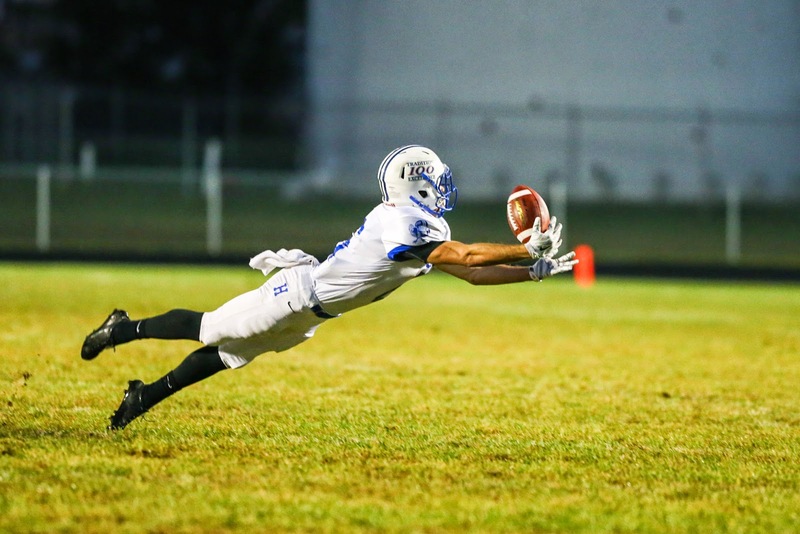 They dropped to 1-7 all-time against Elder (6-3) with a 49-35 defeat in Fort Thomas. Their lone win against the Panthers came three years ago on Oct. 21, 2011 at The Pit, 34-29. 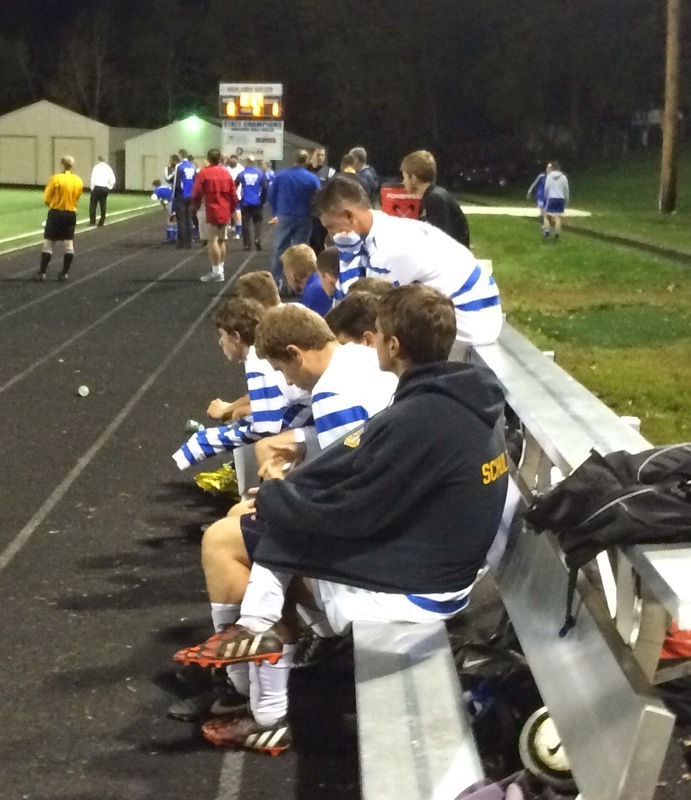 How did the NewCath football, boys soccer teams do Thursday? 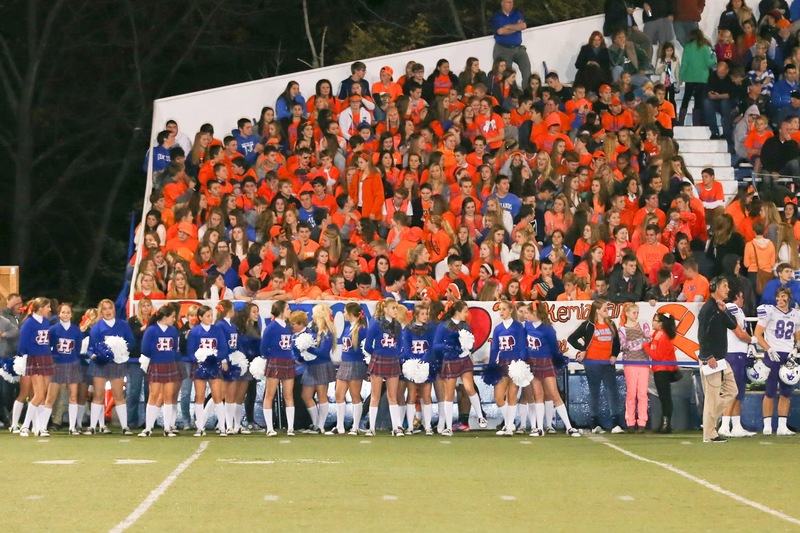 It was similar to last year’s semifinals at Ryle. The Covington Catholic Colonels possessed the ball for the most part against the Newport Central Catholic Thoroughbreds. But NewCath still came away with the win on penalty kicks on its way to a third straight region final appearance. How can NewCath even its record tonight? Allen Ramsey Photo. Newport Central Catholic running back Jacob Smith looks for room in the recent win against Newport. They took care of things quickly a week ago against one overmatched opponent. The Newport Central Catholic Thoroughbreds football team (3-4 overall, 3-0 District 6-2A) would not mind doing it again Thursday at Covington Holmes against another struggling district opponent. The Thoroughbreds face the Covington Holy Cross Indians (1-7, 1-2) at 7 p.m.
What first is Highlands shooting for Friday? Allen Ramsey Photo. Highlands wide receiver Cashel Coughlan (89) tries to make a catch in Friday's win at Covington Holmes. 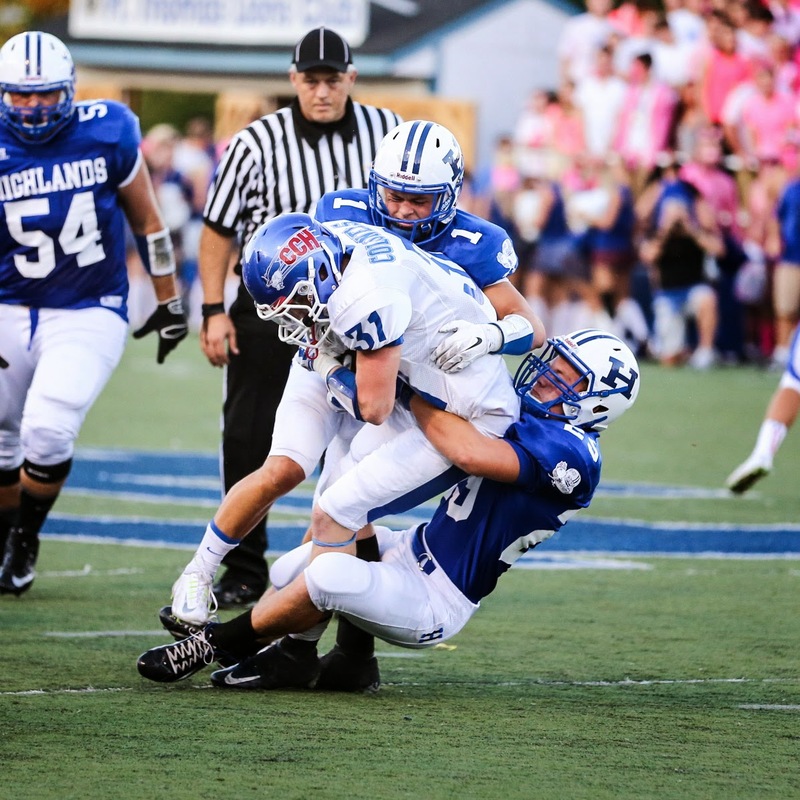 Highlands takes on Cincinnati Elder in Fort Thomas at 7:30 p.m. 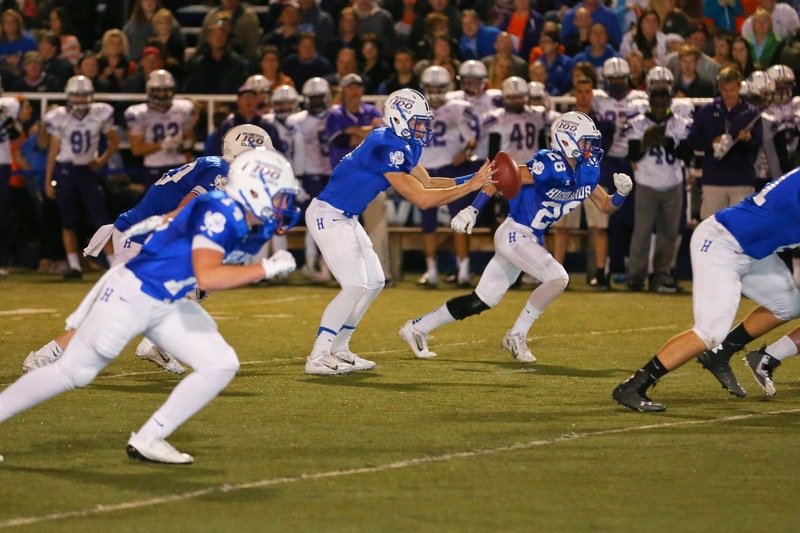 While the Covington Catholic Colonels may be the main arch-rival of the Highlands Bluebirds football team, the Cincinnati Elder Panthers might as well be the main nemesis. 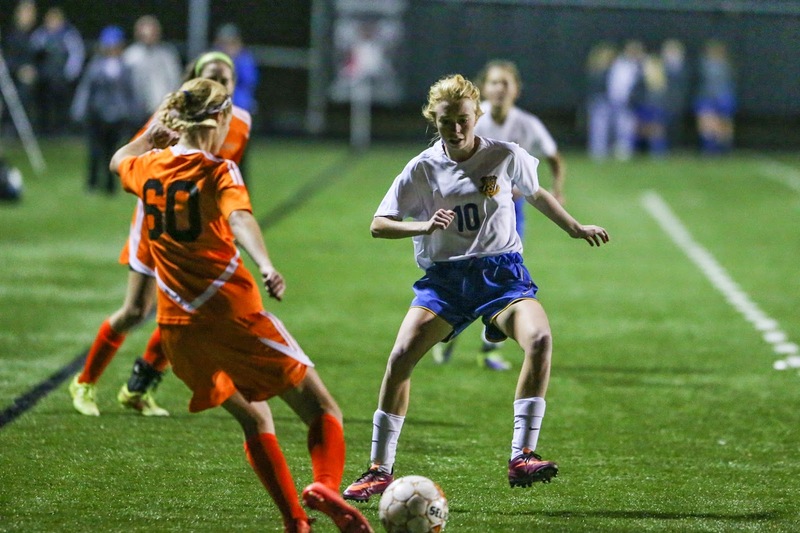 Which 36th district girls soccer team faces Notre Dame for the 9th Region crown Saturday? Allen Ramsey Photo. Newport Central Catholic junior Donnelly Simmins puts pressure on Ryle's Megan Bine in Wednesday's 9th Region semifinal contest. NewCath won 1-0 on penalty kicks. Allen Ramsey Photo. Highlands freshman defender Sophie Steppe (19) goes up for the ball in Wednesday's 9th Region semifinal game against Notre Dame. Lately, it’s been about avoiding drawing the Notre Dame Pandas in order to be playing on a Saturday for a 9th Region girls soccer crown. Did the Highlands, NC Boys soccer teams advance to the 9th semifinals? Allen Ramsey Photo. Highlands junior Noah Sellers (7) battles with Boone County's Dane Thamann (2) in the 9th Region quarterfinals on Tuesday. The Rebels won 1-0 ending the Bluebird season at 9-9-5 overall. They would not have minded to take the field one last time against each other. But that will not happen. The Newport Central Catholic Thoroughbreds pulled off a huge 6-0 win at Cooper in the 9th Region quarterfinals on Tuesday. 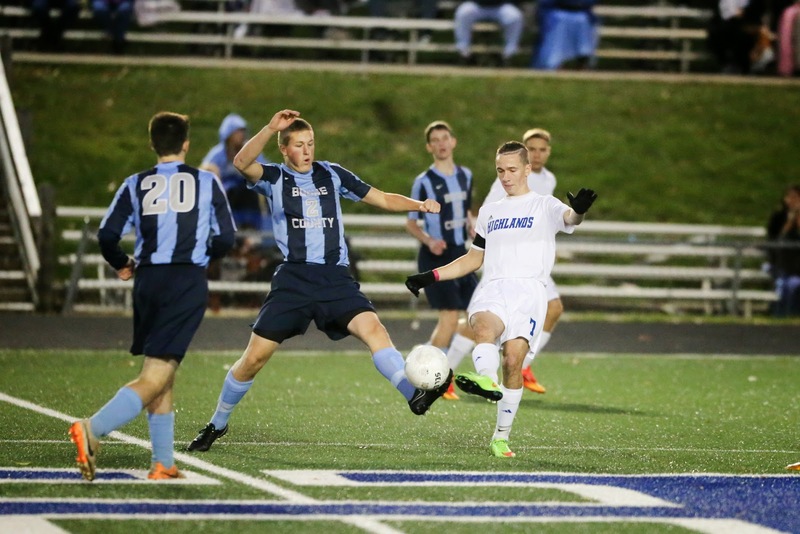 But the Boone County Rebels edged the host Highlands Bluebirds, 1-0. What is at steak for Highlands, NC in the boys soccer regional tournament? Allen Ramsey Photo. 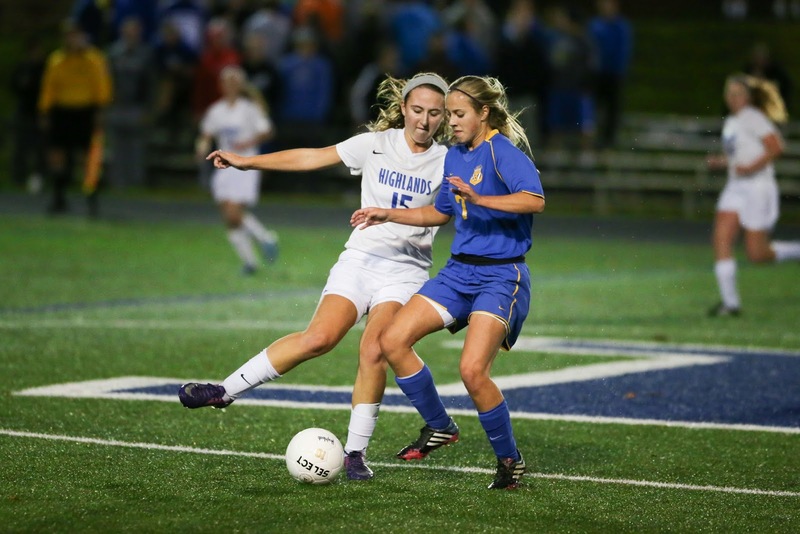 The Highlands (left) and Newport Central Catholic soccer teams battled it out for a district championship last week. They will have more tough battles in the 9th Region Tournament. When thinking of the 9th Region boys soccer tournament, one may think back to the great region title game last year. 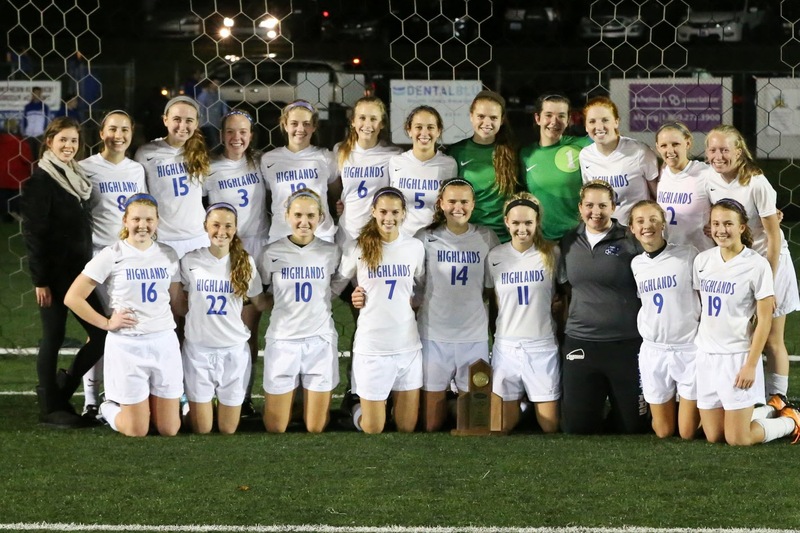 How much did the Highlands, NC girls soccer teams escape by in the 9th Region quarterfinals? Allen Ramsey Photo. Highlands junior Kylie Schuerman sets up to take what would be the game's only goal against Boone County on Monday in the 9th Region quarterfinals. Highlands faces Notre Dame in region semifinals Wednesday. The minimum number of goals sustained both teams on this night in the 9th Region quarterfinals. The Highlands Ladybirds and Newport Central Catholic Lady Bred soccer teams advanced to the region semifinals with 1-0 victories. The 36th District champion Ladybirds (12-9-1 overall) held off the visiting and 33rd runner-up Boone County Lady Rebels before the 36th runner-up Lady Breds beat the 34th champion St. Henry Lady Crusaders. The district champions played host in the region quarterfinals. Who did the Ladybird, Lady Bred soccer teams draw in the 9th quarterfinals? Allen Ramsey Photo. The Highlands Ladybirds are aiming for their first region title since 2010. They play host to Boone County at 7 p.m. Monday. The Highlands Ladybirds and Newport Central Catholic Lady Breds hit the 9th Region Tournament today. Highlands (11-9-1) will play host to Boone County at 7 p.m. and NewCath (13-5-1) ventures to St. Henry. That game starts at 7:30 p.m.
What first did the Bluebirds accomplish at Holmes? Allen Ramsey Photo. Highlands senior Alex Veneman (6) hauls in a pass in Friday's game at Covington Holmes. The Bluebirds improved to 107-6 since the start of 2007 with the 36-0 win. COVINGTON – It had been a little more than a year since the Blue and White kept an opponent off the scoreboard. The Highlands Bluebirds football team did that Friday. Highlands (7-1 overall, 3-0 District 7-4A) ventured into the River City and handled the Covington Holmes Bulldogs, 36-0 to earn that shutout. Bluebird Notebook: How are the younger players developing? Allen Ramsey Photo. Highlands quarterback Beau Hoge (7) scored on a sweep right in the first quarter of Friday's game at Covington Holmes. 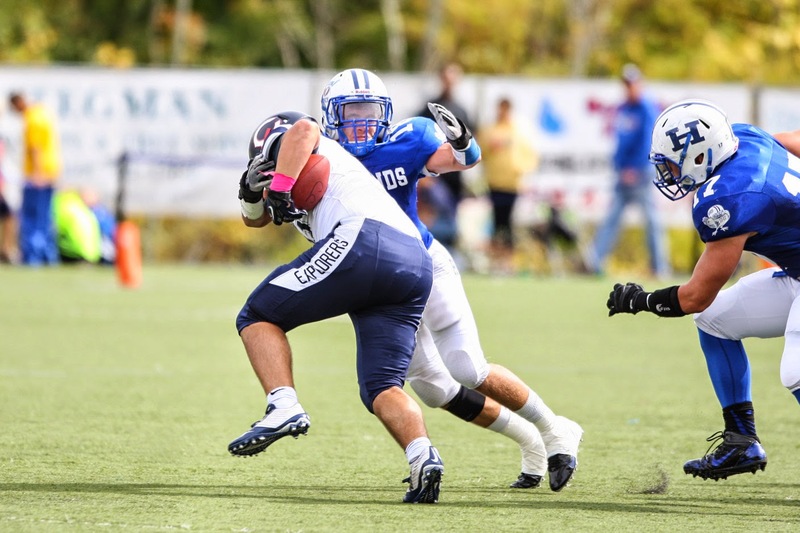 Hoge completed 9-of-19 passes for 149 yards and two touchdowns in the 36-0 Bluebird win. Allen Ramsey Photo. Evidence shows that Alex Veneman (6) caught the ball with one foot in-bounds in the first quarter of Friday's District 7-4A game between Highlands and Covington Holmes. The officials ruled Veneman's catch out of bounds on the play. But Veneman still recorded six catches for 119 yards in the win. 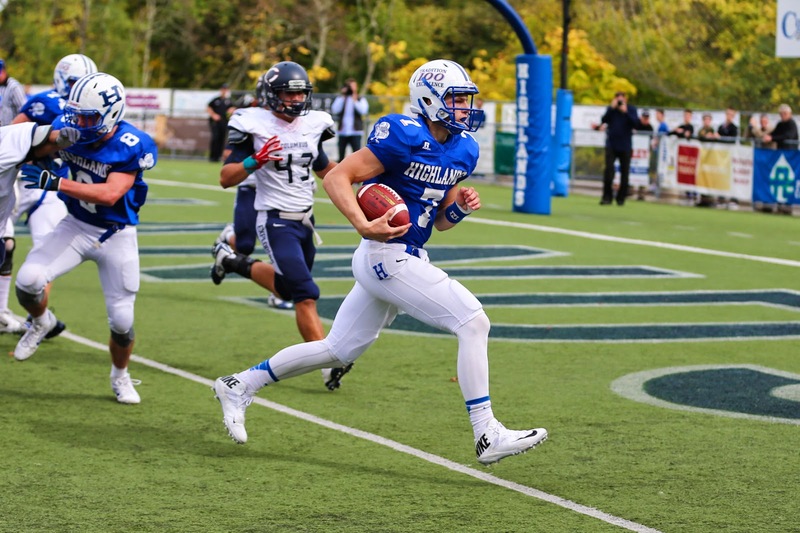 In lopsided contests, the younger Highlands Bluebirds earn some playing time. That has been the case in all three district contests this year. Highlands (7-1 overall, 3-0 District 6-4A) hit the running clock in the three district contests and the wins over Paducah Tilghman and John Hardin. The hosts wanted to make short work in this one and that’s exactly what happened. Who is the most common opponent in Highlands history? Allen Ramsey Photo. Highlands linebacker Brady Murray (back) makes a tackle in Saturday's game. The Bluebirds travel to Covington Holmes on Friday. High school football fans in Northern Kentucky know this line real well. 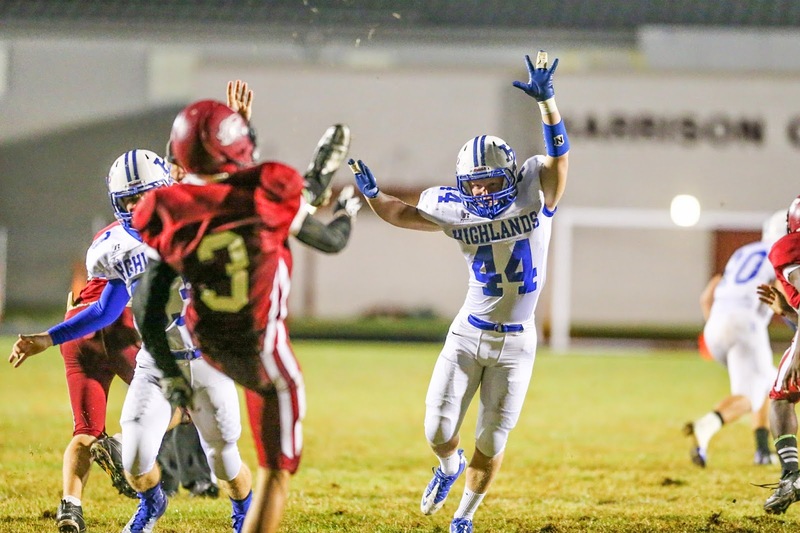 The Highlands Bluebirds own a perfect 27-0 mark against district opponents since 2007. That includes a 5-0 mark against Friday’s opponent in the Covington Holmes Bulldogs. Game time is 7 p.m. in Covington. What do the Thoroughbreds need to do to move to 27-0 in district action since 2007? Allen Ramsey. Newport Central Catholic's Erik Anderson goes up for a catch in Friday's game against Newport. Anderson leads the Thoroughbreds with three interceptions. Both football teams may be focused more on themselves than the opponent on Thursday. 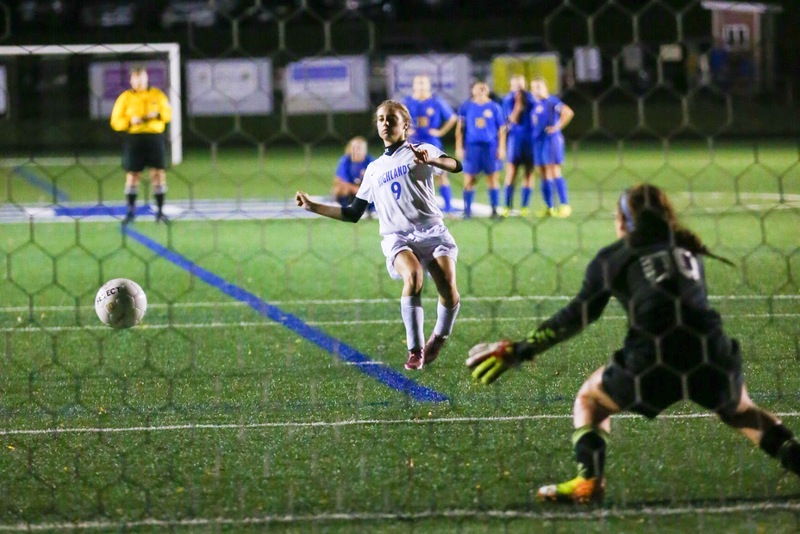 What decided the latest 36th District girls soccer championship? Allen Ramsey Photo. Highlands midfielder Kiersten Clukey (left) and Newport Central Catholic's Jenna Ahlbrand (right) battle for the ball near midfield in Wednesday's 36th District championship game. Highlands won 1-0 on penalty kicks. Allen Ramsey Photo. Highlands junior Kylie Schuerman (9) watches the game-winning penalty kick while Newport Central Catholic goalkeeper Meg Martin (00) gets in position. The Ladybirds have won eight district championships in the last nine seasons. It was only fitting this one went to penalty kicks. 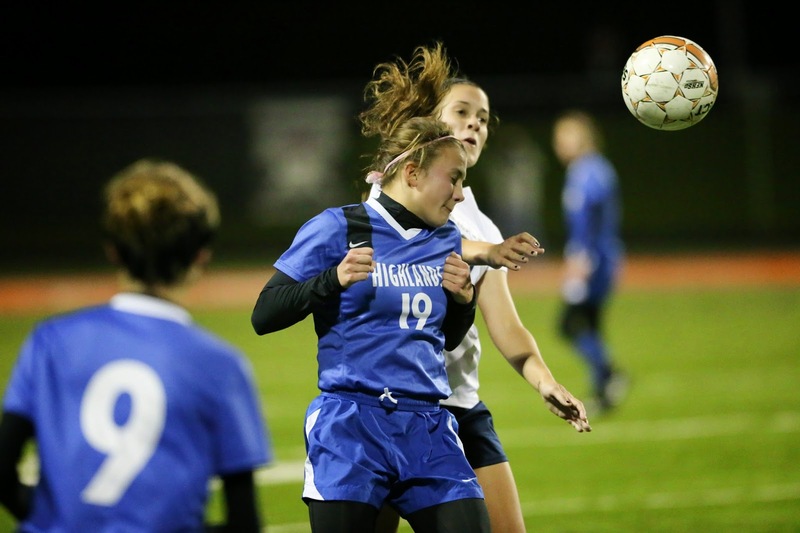 The rival Highlands Ladybirds and Newport Central Catholic Lady Bred soccer teams had to do that after neither team put one home in either the 80 minutes of regulation or the two five-minute overtime periods. Highlands won the penalty kicks, 4-2 for a 1-0 victory Wednesday in the 36th District championship. How many rounds of penalty kicks decided the latest Highlands-NC soccer rivalry? Allen Ramsey Photo. Highlands senior Vadim Lightner (22) tries to head one home while teammate Noah Sellers (7) gets in position. Newport Central Catholic's Paul Grosser (1), Seth Freppon (11) and Jacob Hensley (12) also get in position. Allen Ramsey Photo. 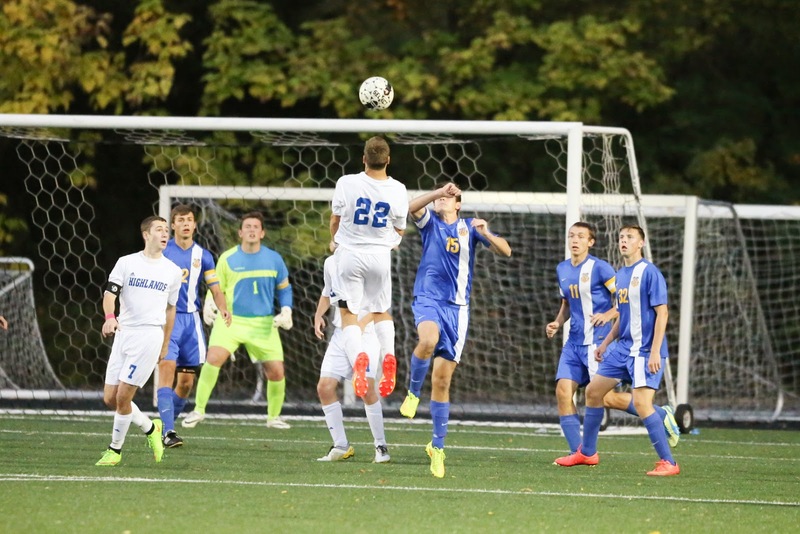 Highlands junior Ben Seiter (19) battles for the ball in Tuesday's 36th District title game. Highlands won 2-1 on penalty kicks. A normally-intense soccer game took longer to decide in this one. 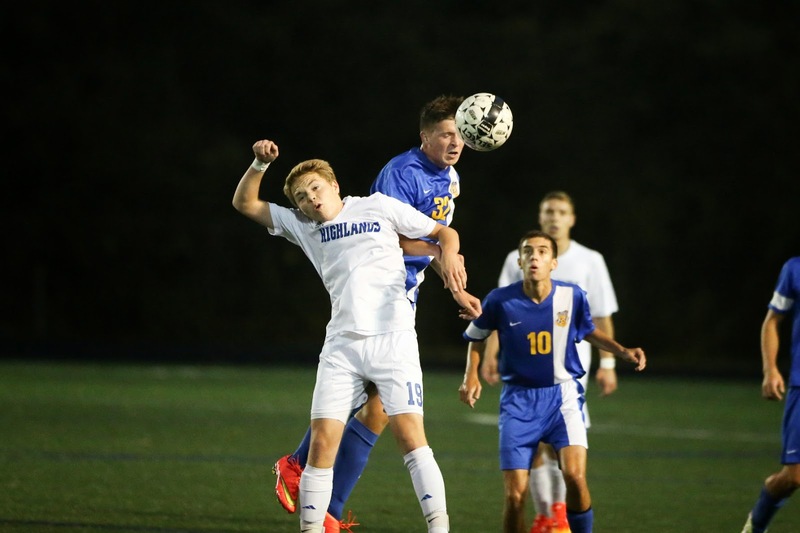 The Newport Central Catholic Thoroughbreds and Highlands Bluebirds soccer teams had to use penalty kicks to decide the 36th District championship on Tuesday at Tower Park. The Bluebirds won it in the ninth round, 2-1 for their first district championship since 2010. First-year Head Coach Katelyn Sallee wants to see the Highlands Ladybirds volleyball team have a winning season. Allen Ramsey Photo. Highlands senior Taylor Vaughn plays on inside the attacking zone in Monday's 36th District semifinals at Tower Park. Vaugnn scored twice and had two assists. 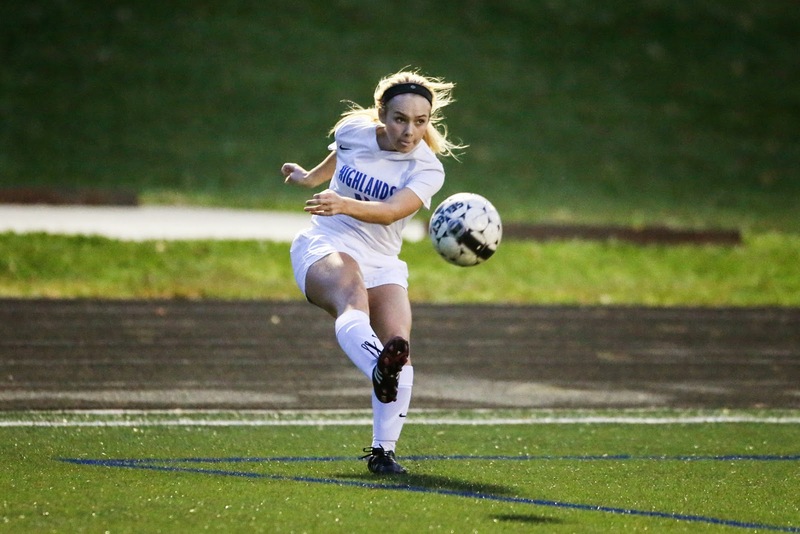 She leads Highlands with 13 goals on the season as Highlands beat Dayton, 10-0. The Highlands Ladybirds soccer team (10-9-1) reached double-digit wins for the first time since 2010 Monday. The Highlands Bluebirds soccer team moved back to .500 with a sound 6-2 win over the Dixie Heights Colonels on Saturday at Tower Park. Who won the showdown between state-ranked Highlands, Florida opponents? Allen Ramsey Photo. Highlands wide receiver Alex Veneman (6) hauls in a touchdown pass in the first quarter against Christopher Columbus cornerback Trajan Bandy (26). Veneman had seven catches for 133 yards and two touchdowns in Highlands' 38-34 loss. 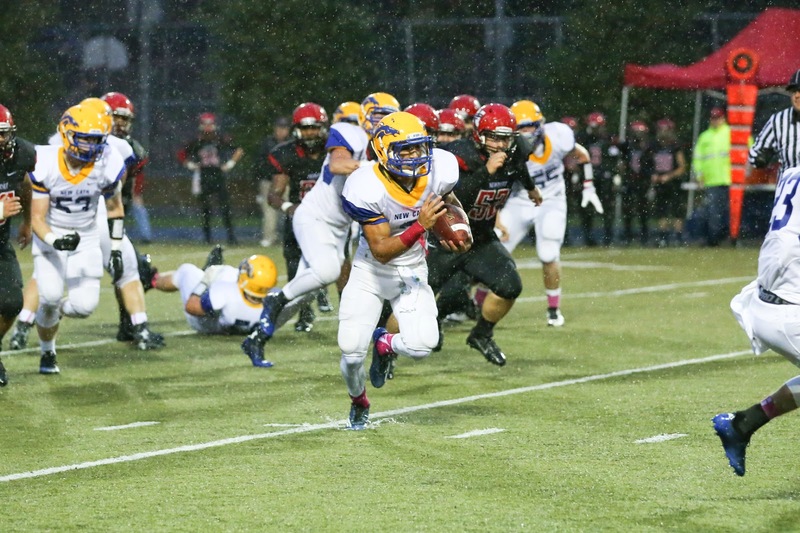 It is not often that the Highlands Bluebirds football team comes out flat. But one of those rare times came Saturday. 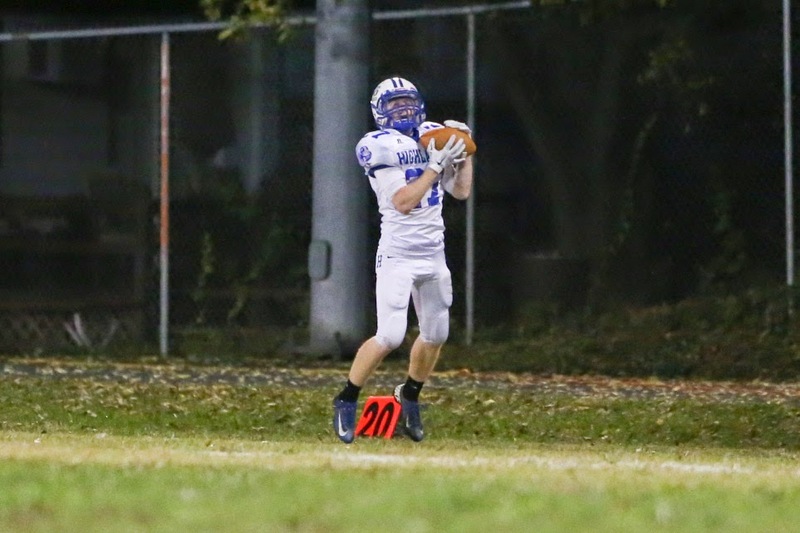 Class 4A’s top-ranked Bluebirds found themselves down 28-7 at halftime as a result. They rallied in the second half but fell 38-34 to the eighth-ranked Miami (Fla.) Christopher Columbus Explorers of Florida’s largest Class 8A, District 14. Both teams are 6-1 on the season. Did the home-field advantage again pay off for Highlands? Allen Ramsey Photo. Highlands senior defensive lineman Daniel Kremer (22) goes for a tackle while Rocco Pangallo (17) follows closeby in Saturday's game against Miami (Fla.) Christopher Columbus. Allen Ramsey Photo. Highlands quarterback Beau Hoge (7) scores on a sweep in the fourth quarter while Nick Kendall (8) blocks in Saturday's game against Miami (Fla.) Christopher Columbus. 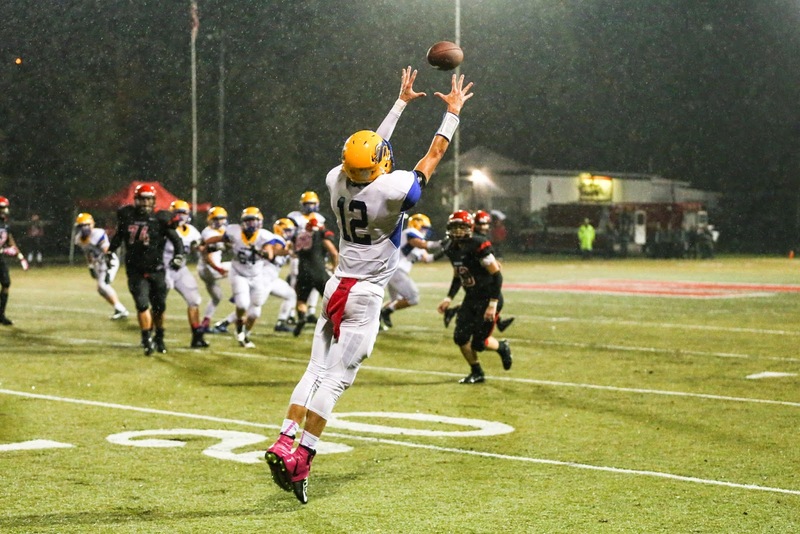 Hoge completed 24-of-38 passes for 330 yards, four touchdowns and an interception. 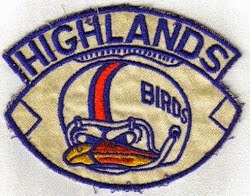 The Highlands Bluebirds hoped to use that same home advantage that has helped them over the years. They entered Saturday’s game with a sparkling 59-1 record at David Cecil Memorial Stadium since the start of 2007. How did the Fireman's Bell game turn out? Allen Ramsey Photo. Newport Central Catholic running back Jacob Smith (3) scores a 12-yard touchdown in the second quarter of Friday's game against Newport. 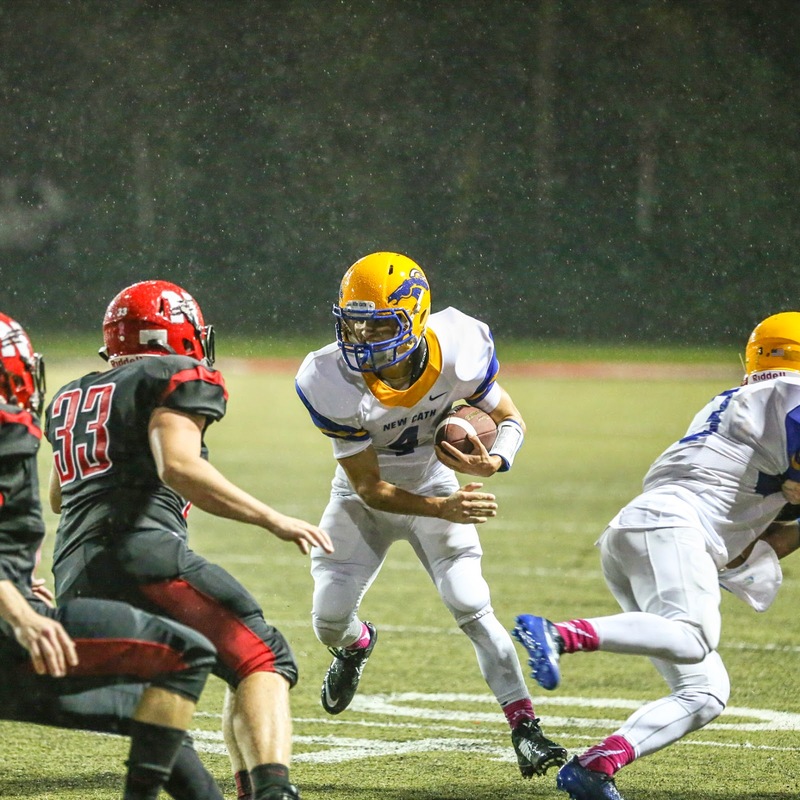 Smith rushed for 177 yards and two touchdowns on 26 carries in NewCath's 15th straight win over Newport. Allen Ramsey Photo. Newport Central Catholic senior Logan Neff (53) puts pressure on Newport punter Kameron Covington (42) in Friday's game. The Thoroughbreds won 22-17 to move to 2-0 in District 6-2A action. NEWPORT – The Newport Central Catholic Thoroughbreds football team faced two big challenges on Friday. How did the regular season finale go for the Ladybirds? Allen Ramsey Photo. 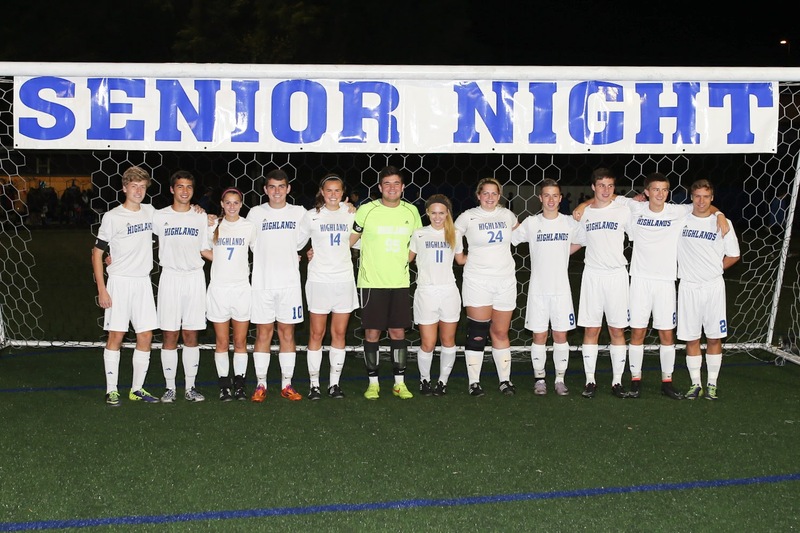 Highlands celebrated Senior Night for the soccer teams on Thursday. Both teams recorded shutout wins. October means it is time to rev up the motors full-throttle for the postseason. The Highlands Ladybirds soccer team generally does just that. Highlands recorded three straight wins on its way to a 9th Region runner-up finish to eventual state champion Notre Dame last fall. G. Michael Graham Photo. Current and future Highlands soccer players formed a line for the Highlands seniors to walk Thursday. Senior Night turned into a second straight win for the Highlands Bluebirds soccer team (7-8-5) on Thursday. 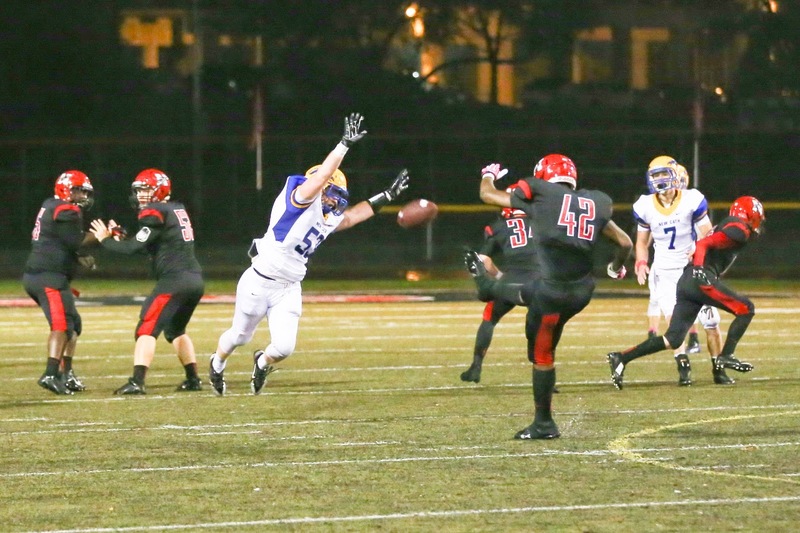 Which highly-rated Florida team comes to Fort Thomas on Saturday? Allen Ramsey Photo. Highlands senior defensive lineman D.J. Mills (42) and junior linebacker Conner Welsch (5) get in on a tackle in the recent game against Covington Catholic. 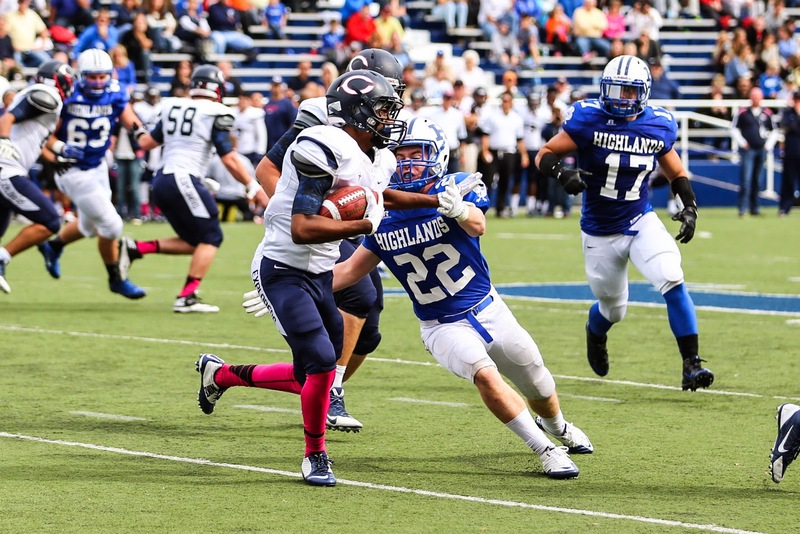 Highlands battles Miami (Fla.) Christopher Columbus on Saturday in Fort Thomas. A lot of non-surprising hype came with their first-ever meeting against a team from the Sunshine State to open last season. The then six-time defending state champion Highlands Bluebirds welcomed the defending Florida Class 2A champion University Christian Fighting Christians from Jacksonville to Fort Thomas in a nationally-televised game. But the game did not live up to the buzz. The Bluebirds pulled away from the worn-down Fighting Christians for a 47-17 victory. 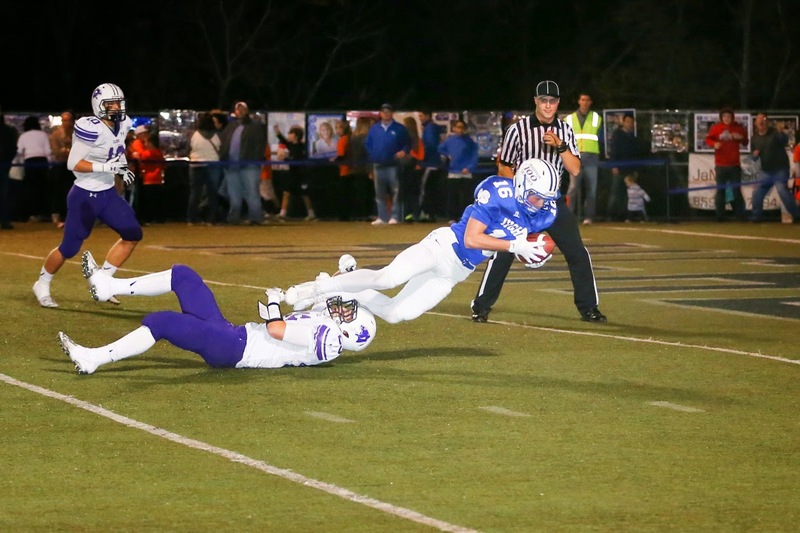 Why might NewCath's game against the in-town rival be closer this year? G. Michael Graham Photo. Newport Central Catholic quarterback Patrick Henschen (16) hands off to junior running back Jacob Smith (right) in the game earlier in the season against Dixie Heights. A year ago, no one guessed the annual city championship would also decide the District 6-2A championship. Labels: Newport Central Catholic Thoroughbreds football, Newport Wildcats. Did the trend in the NC-Highlands volleyball series continue or swing the other way? Allen Ramsey Photo. Highlands freshman Emma Delagrange (20) tries to block a spike attempt by Newport Central Catholic's Laura Brannon (3) in Tuesday's match. NewCath won 3-1. Allen Ramsey Photo. Newport Central Catholic's Olivia Owens (center) reaches for the dig in Tuesday's 36th District match against Highlands while teammate Alexa Kehoe (5) and Highlands' Jessica Ginter (9) get in position. NewCath won for the 18th time in the last 19 meetings. NEWPORT – This volleyball game portrayed what often happens with life. The 36th District rival Newport Central Catholic Thoroughbreds and Highlands Ladybird volleyball teams looked good one game then not so good the next. But the Thoroughbreds (13-9) fought through the adversity for a 3-1 (25-16, 22-25, 25-8, 25-18) win to clinch the top seed in the district tournament to be played at Bellevue. They have a winning record against a tough schedule. 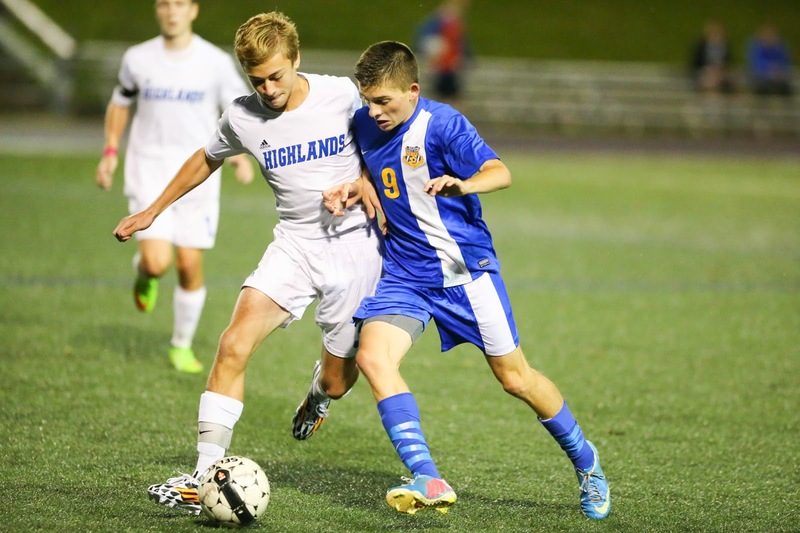 Both Highlands soccer teams downed visiting Covington Holy Cross on Tuesday. The Ladybirds (8-9-1) equaled last year’s win total with a 5-0 shutout. That was their fifth shutout of the season. 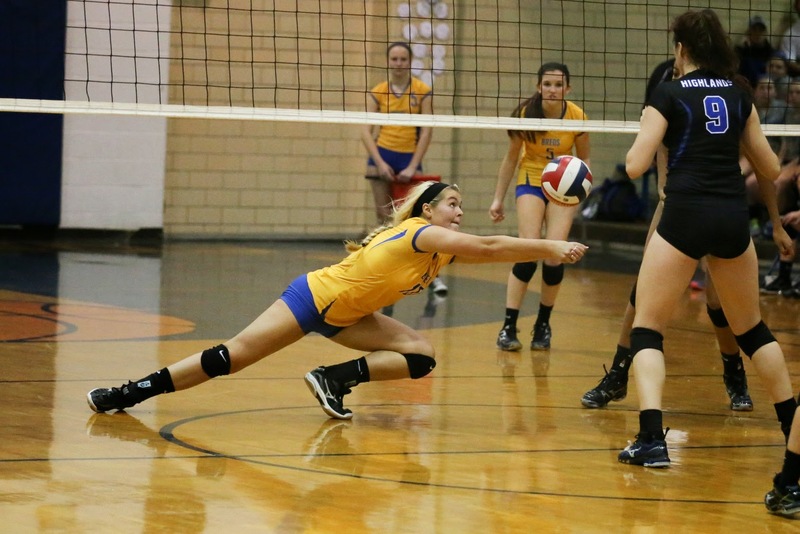 The Newport Central Catholic volleyball team (12-9) earned another 9th Region win on Monday on the road. The Highlands volleyball team went 2-1 on the second day of the Jefferson County Invitational Volleyball Tournament at the Ohio Valley Volleyball Center in Louisville. The Ladybirds moved to 11-13 overall. How many consecutive points did Highlands score in the win in Cynthiana? Allen Ramsey Photo. 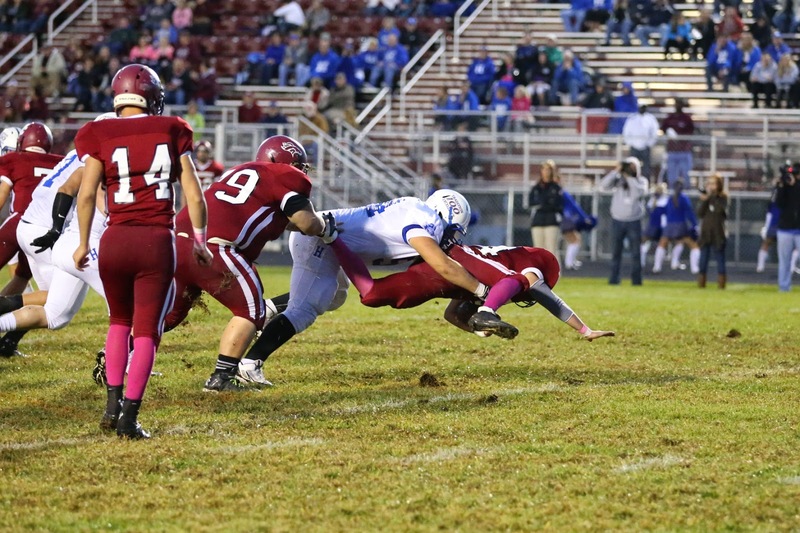 Highlands senior linebacker Ben Ellison (44) puts pressure on Harrison County punter Jordan Kenney (3) in Friday's game in Cynthiana. Highlands won 46-13. 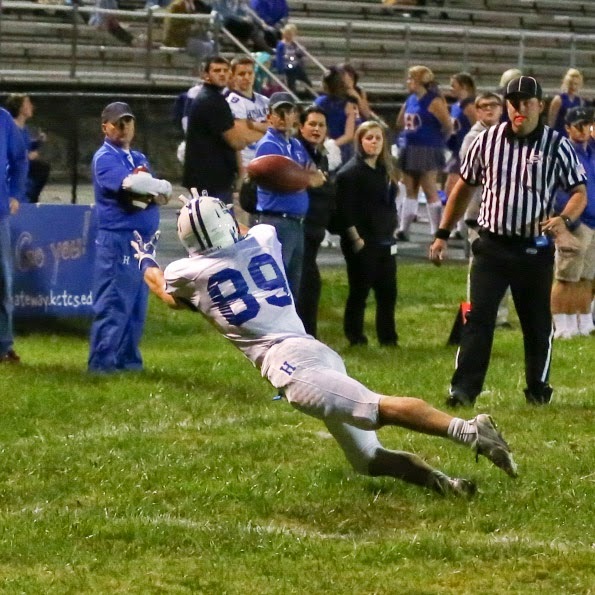 CYNTHIANA – Believe it or not, the hosts had a brief glimmer of hope on their football Homecoming game. Has Highlands gained any ground on Valdosta in terms of all-time program wins? Allen Ramsey Photo. Highlands wide receiver Alex Veneman tries to make a catch in the first half of the game at Harrison County on Friday. 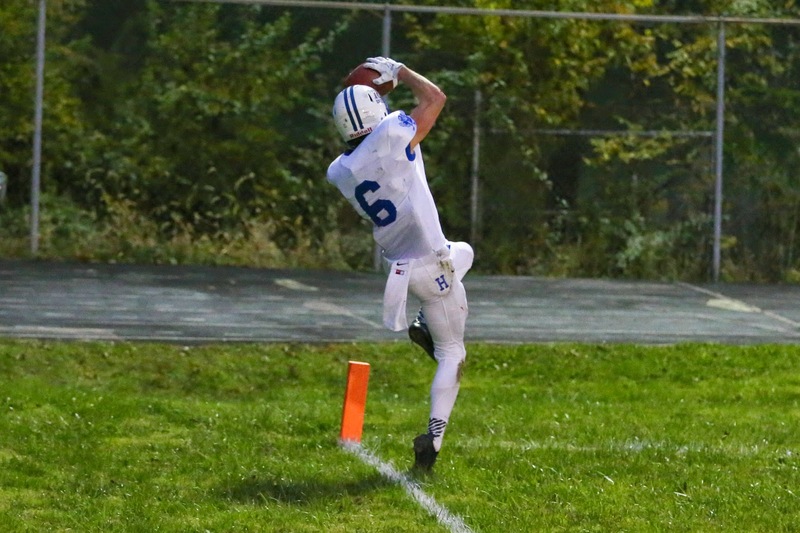 Veneman did not make the catch, but he finished with nine catches for 171 yards and two touchdowns in the 46-13 Bluebird victory. Allen Ramsey Photo. Highlands junior Tyler Robinson (middle) brings down Harrison County running back Brandon Williams (right) in Friday's game. Highlands moved to 6-0 with the victory. Some people might be coming impatient with the idea their beloved high school football team has not beaten the Highlands Bluebirds in a while. The Highlands Ladybirds volleyball team went 1-1 on the first day of the Jefferson County Invitational Volleyball Tournament in Louisville on Friday. The Highlands Ladybirds soccer team (7-8-1) has won four of its last five games moving near .500 with a 3-0 blanking of the host Beechwood Lady Tigers on Thursday in Fort Mitchell. The Newport Central Catholic Lady Breds (10-4-1) soccer team dropped their third straight in Union on Wedneday. Ryle blanked them 3-0. 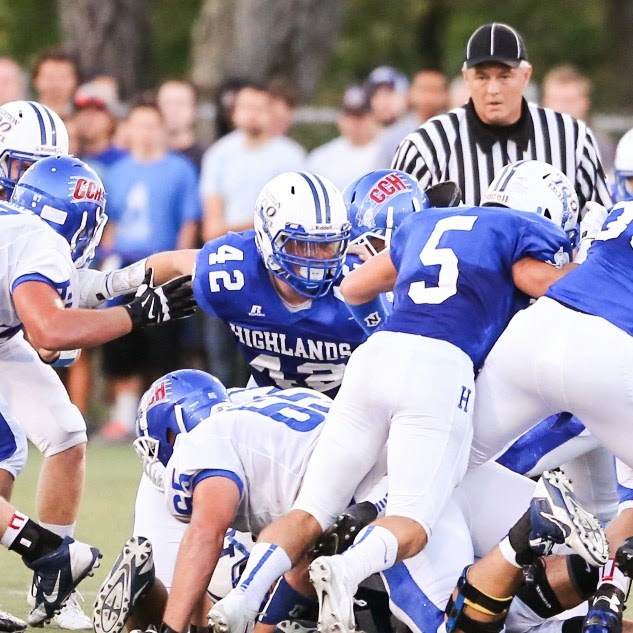 What has been Highlands' average margin of victory against Friday's opponent? Allen Ramsey Photo. Highlands' Jacob Noe (right) and James Hinkel (1) wrap up Covington Catholic running back Ben Darlington (31) while Tyler Robinson (54) gets into position. The usually-tough week is behind them with another victory. 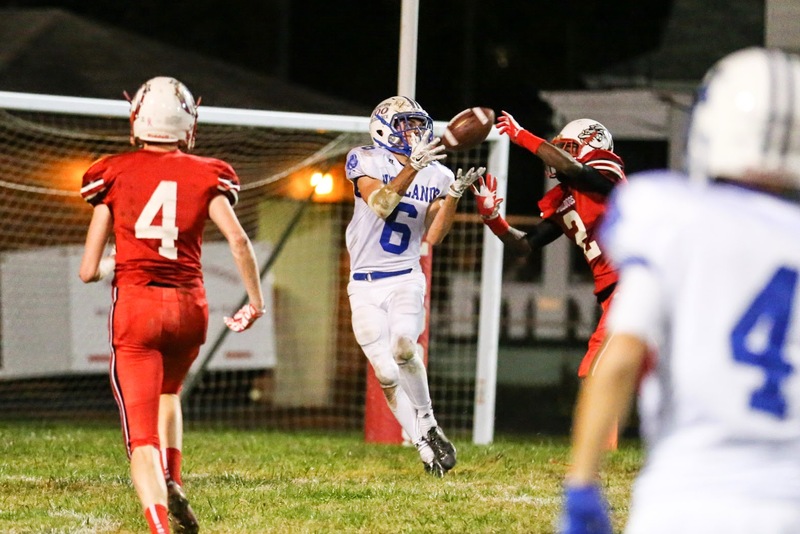 The undefeated Highlands Bluebirds football team (5-0) can now focus on another District 7-4A opponent this week after throttling Covington Catholic, 42-7 on Friday. 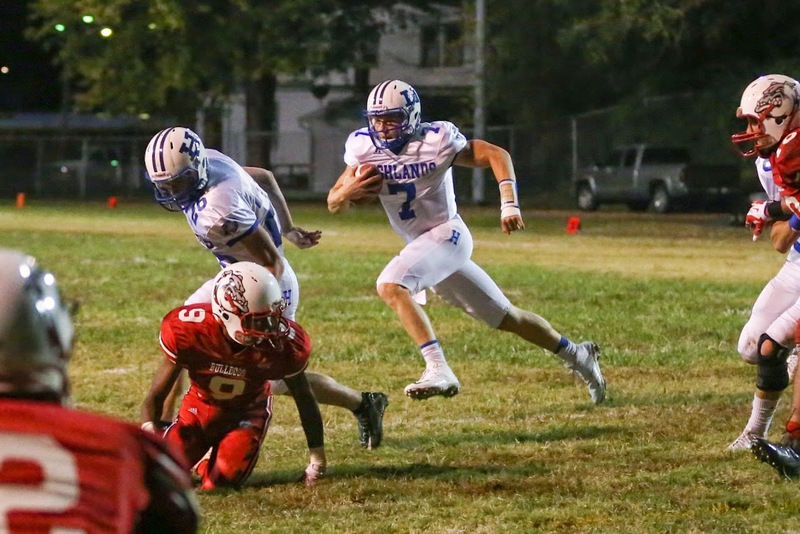 The Blue and White travel to Cynthiana on Friday to face the winless Harrison County Thorobreds (0-6) at 7 p.m. Which former Highlands player, assistant coach leads the Campbell County program? G. Michael Graham. Campbell County Head Soccer Coach Matt Ewald watches during pregame warm-ups against Highlands a week ago Monday. The 2000 Highlands graduate is in his first year as head coach of the Camels. Matt Ewald waited his time before becoming a head coach. The Campbell County job came open this past offseason and Eward received it. The 2000 Highlands graduate served as an assistant at his alma mater for five seasons between 2008 and 2012. The Bluebirds finished state runner-up in his first season as an assistant. The Highlands Bluebirds soccer team (4-7-5) played its most complete game of the year dominating the Pendleton County Wildcats, 9-0 at Tower Park on Tuesday.